In 2015, Jesse “Hard Work” Hart fought and won three times, winning all three by knockout. He improved his perfect record to 19-0, 16 KOs, and put himself on the verge of a world title shot. He started the year with the NABF super middleweight belt already around his waist and added both the USBA and NABO titles in May. He earned these new two titles with a knockout of Mike Jimenez on the biggest show of the decade – Mayweather vs. Pacquiao in Las Vegas. With three regional belts and world rankings by three organizations, Hart tripled his chances for world championship opportunities. He couldn’t capitalize in 2016 due to a hand injury. However, with his return scheduled for November 4th, he is clearly in position for a big fight next year. 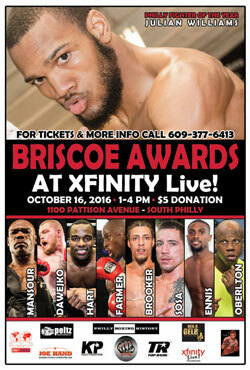 Jesse was the “2012 Rookie of the Year” at the Briscoe Awards a while back, and will add his second Briscoe Medal on Sunday, October 16, 2016, 1-4 pm, at Xfinity Live! in South Philadelphia. Admission is $5. Come to and support Jesse Hart, the other winners and the rest of the Philly boxing community on Sunday. 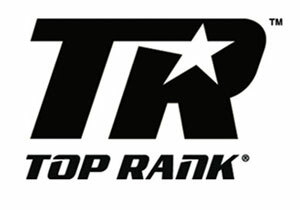 The “Prospect of the Year” award is sponsored by Top Rank.